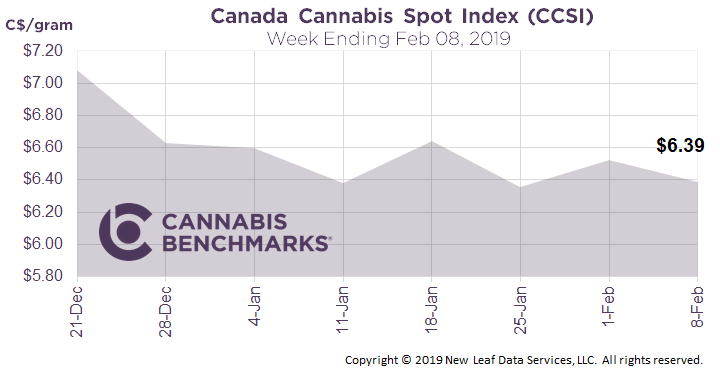 The CCSI moved 2.2% lower this week to C$6.39 per gram, from C$6.53 per gram. The index looks to have found its sweet spot within a narrow C$0.28 range. C$6.39 per gram equates to US$2,196 per pound at current exchange rates. This week we take a deeper look at the final price consumers are paying for dry cannabis products. Each provincial retail structure is set up slightly differently, but ultimately consumers purchase recreational cannabis in pre-rolls or canisters. Unlike products sold in the U.S., Canadian cannabis packaging enforces strict volume and labelling guidelines. The canisters are mainly sold in one gram, 3.5 gram, and 7 gram increments with a strict labelling protocol that includes the producer’s brand, strain information and Health Canada warning labels. Many of the recent supply issues have been attributed to faulty packaging. 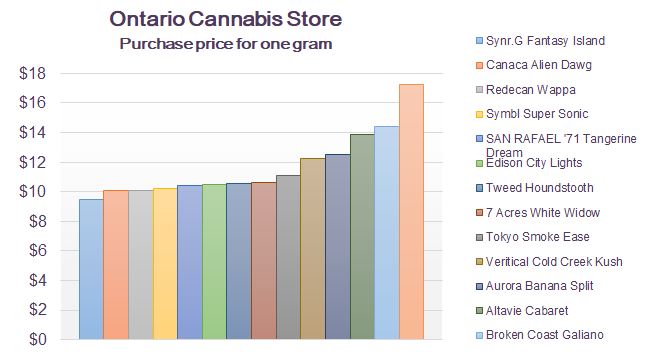 For this week’s analysis, we specifically focussed in on the retail price of 14 out of the 80 listed dry cannabis products on the Ontario Cannabis Store (https://ocs.ca/). We chose a variety of products from different licensed producers (LP), varying THC and CBD levels, and assorted flower types (Sativa, Indica, or Hybrids). 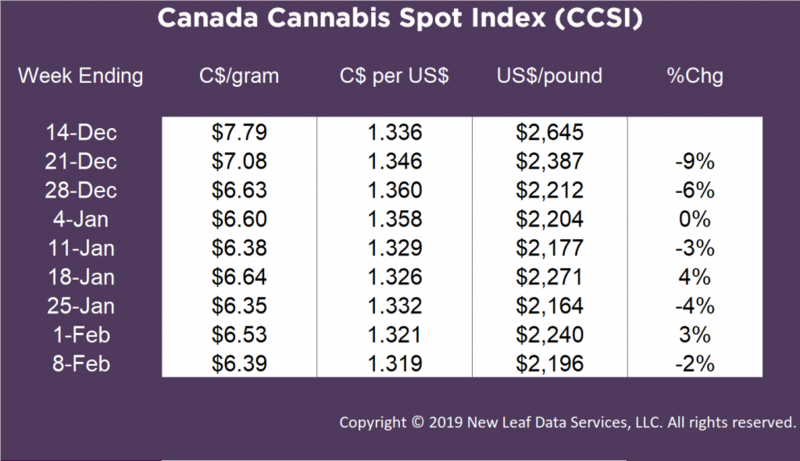 Of the 14 products, the calculated average selling price for one gram was C$11.66 (inclusive of the 13% retail sales tax) with a range of C$9.25 to C$17.25. 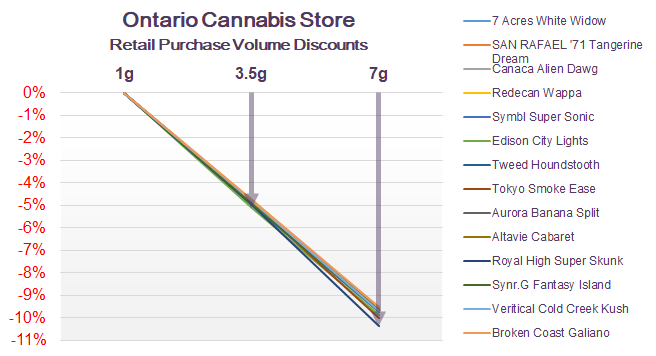 Lastly, we looked at the volume discount customers are given when they buy quantities larger than one gram. For many of the 14 products we analyzed, there were prices listed but no product available in those larger quantities. As can be seen in the chart below, the discount was almost standardized as consumers purchased larger quantities with a 4.9% discount when customer purchased 3.5g, and 9.7% discount when customers purchased 7g.